Architect Arne Jacobsen (1902-1971) primarily drew plans for buildings during his career that took off during the late 1920s. Today, however, he is more well known for the furniture he conceived with function in mind. Like Charles and Ray Eames, who indeed influenced his work, Jacobsen's designs are considered Mid-Century furniture masterworks with lasting appeal. While he was from Copenhagen, Denmark, his furniture pieces weren't typical Danish Modern in design. In fact, it has been said that his work was the least Danish Modern among his contemporaries hailing from Scandinavia. His unique conceptions of what furniture should be have earned him a spot among the most popular modernist designers with collectors today. Jacobsen's furniture exhibits unique style, but pieces are quite comfortable and practical as well. Other items he designed, including sets of flatware, tea services, and cocktail sets, also remain very functional, in addition to being interesting to display in homes and businesses showcasing modern style. The Danish furniture company, Fritz Hansen, manufactured Jacobsen's designs beginning in 1934, but really firmed up their design partnership by producing his laminated Ant chair (see below) in 1952. Jacobsen's vision dominated this manufacturer's output in the 1950s, but even today his designs are some of the company's most noteworthy and popular products, including numerous chair styles among other pieces. The Egg Chair is Jacobsen's signature piece, and one of his most recognizable designs. The chair and matching footstool date back to 1958. This curvilinear seat has many fans among modernism enthusiasts, and is still being made today to fill that demand. It was one of the pieces used to furnish the SAS Royal Copenhagen Hotel, which opened in 1960. Jacobsen's shapely Egg Chair was only one of the features bearing his influence among the SAS Royal Copenhagen Hotel's cool furnishings. Jacobsen not only drew the plans for the SAS Royal Hotel building as its architect, he designed every interior detail right down to the hardware. 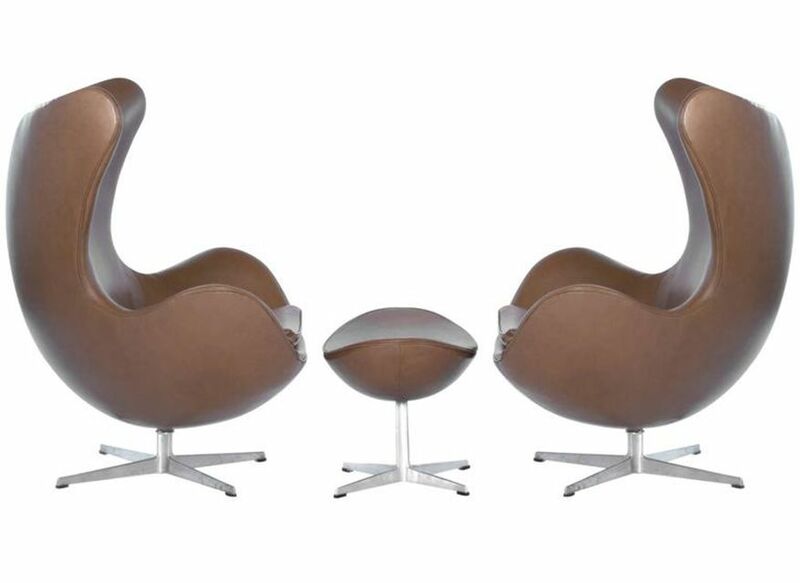 The Egg Chair, like the Swan Chair shown below, was elongated into a sofa-sized version. But while the Swan version is still being made, only a few of the Egg couches were manufactured, making them quite exclusive, and expensive, to own. Another signature style, also introduced in 1958, was Jacobsen's Swan chair. This style was also used to outfit the SAS Royal Copenhagen Hotel when it opened in 1960, and also furnished other businesses like the Danmarks Nationalbank during that era. This design with wing-like upturned sides and chrome base has been in continuous production by Fritz Hansen since it was introduced. It comes in a variety of upholstered colors and leather as well. The Swan chair was adapted into a sofa, incorporating the same type of side treatment. This popular design, used originally in the panoramic restaurant at the SAS Royal Copenhagen Hotel, is also still being sold today. Before the Egg and the Swan, came the Ant. While it certainly became popular outside of corporate use, the Ant chair was actually commissioned for use in a pharmaceutical company cafeteria in the early 1950s. Wondrous in its simplicity, this chair is formed of molded material with four legs. In addition to looking thoroughly modern and unique, it is easily stacked making it quite functional for large rooms as it was originally intended. It remains quite stylish in more intimate spaces such as the kitchen of a modernly decorated home. As seen in the illustration, these chairs stack well for storage, just like the Series 7 Chair shown below. After a visit to the SAS Royal Copenhagen Hotel, officials of St. Catherine's College in Oxford, England requested that a chair be made for the use of professors within their Jacobsen-designed campus, which opened in 1963. The result is still dubbed the Oxford Chair. While the basic seat style is the same, this chair has been made in high-, low-, and mid-back versions with a chrome star-shaped base with and without castors and/or arms. Variations have been made in varied upholstery colors through the years since it was introduced, but black leather is the most recognizable. This chair has found a home at the desk as it was originally intended, but also serves meeting rooms and dining rooms equally well. This chair style introduced in 1955 is an all-time bestseller for Fritz Hansen with literally millions out the door. The design for this consumer favorite was inspired by the work of Charles and Ray Eames. It incorporated, some even say perfected, techniques for molding and bending plywood invented by the husband and wife duo. The Series 7 Chair, also known as Model 3107, is light in weight and stackable like its Ant chair predecessor, providing a wide range of uses from corporate settings to modern homes. Many, in fact, have served as dining chairs in kitchen alcoves with coordinating tables (see below). This chair style has been widely reproduced, but originals are marked indicating Fritz Hansen as the maker on the underside. Since each original vintage chair usually sells for $300-600, and sometimes more depending on the variation in materials, it's wise to keep this in mind. While much discussion, and rightfully so, revolves around Arne Jacobsen's innovative chair designs, he also designed tables to go along with them. While equally as functional and well made as the clever chairs he conceived, the table styles are usually very basic. Most have a round, square, or oblong top with either simple legs or a pedestal bases akin to those used on Jacobsen's chairs. Fritz Hansen manufactured these original tables and many were sold as dining sets with Series 7 Chairs (see above) in coordinating materials such as teak or rosewood with chrome legs. Because of the basic designs in a variety of sizes, these tables could also be adapted for use in cafe settings and businesses in addition to the Mid-Century home.